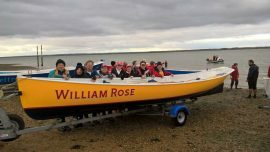 In November 2017 the Club was awarded a second £10,000 grant from Sport England towards the purchase of a second Safety Boat as part of our Safely Does It project, to help us to “sustain and further increase participation in Coastal Rowing whilst still supporting activities such as dinghy and cruiser sailing and racing”. 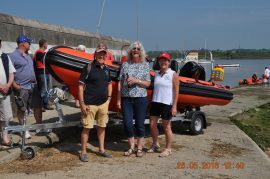 Our new second safety boat, an XS Ribs Five Metre Orange Rib with a 60HP Mariner Engine plus a new Snipe Trailer was ordered in January 2018 and was formally launched at our ‘Push the Boat Out’ Event on Bank Holiday Monday 28 May in time for the summer sailing and rowing season. The Sport England Funded ‘Safely Does it’ project ran from December 2017 to November 2018 and we kept a Club Rowing log for the year long project with details and pictures of from all the Club Rows and Races over the year. The log aims to show the fun and activity beyond the numbers. A PDF version of the log is available below. In May 2016 the Club was awarded a £10,000 grant from Sport England towards the purchase of a Harker’s Yard Gig as part of a Coastal Rowing project to “expand participation through supporting formal, organised “Club” coastal rowing to provide low cost, open access opportunities for people of all ages and abilities to get involved in rowing and keep rowing”. The Rose Family have also donated additional funding to the Club for the rowing project in memory of Bill Rose for whom the Gig is named. The Sport England Funded ‘Coastal Rowing’ project ran from 1 June 2016 to 31 May 2017. We kept a Club Rowing log for the year long project with details and pictures of from all the Club Rows and Races over the year. The log aims to show the fun and activity beyond the numbers. A PDF version of the log is available below.